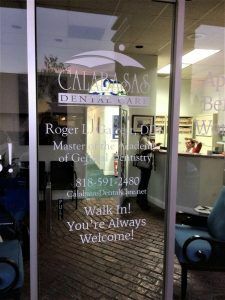 Calabasas Dental Care is a dentist’s office in Calabasas, California that has wall-length windows protruding out into the walkway of the plaza. They had a couple of existing ads on either side of the windows, but they wanted to use the space they had to help advertise the business. 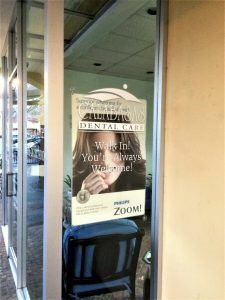 We were originally contacted by a dental marketing company for the window graphics for Calabasas Dental Care. They had already come up with the design and dimensions for all of the windows, and they just needed someone to make and install them. When you first decide to purchase a new sign, the first thing you consider is how it is going to look. While some customers ask us for advice on what they should do, others have designers and marketers they work with and already know exactly what they want. This can be very helpful to us since the quoting and proofing process can go very quickly, however, if you are interested in our expertise, we are more than happy to help with design also. The designer provided us with all the information and we got started. After the initial contact with the designer, everything else was done through Dr. Garrett, the owner of the business. After we sent the quote, he wanted to move forward right away so we got started with the proof. We do not start making the sign until the proof is approved to make sure that what we are making is exactly what the customer wants. In this case, we only had to make 1 revision. We made Dr. Garrett’s name larger, and instead of “MAGD”, Dr. Garrett wanted to write out “Master of the Academy of General Dentistry” in case someone didn’t know what MAGD stood for. 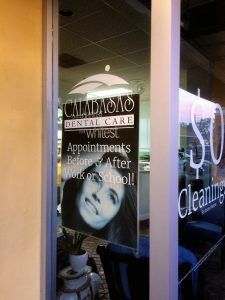 Calabasas Dental Care really focuses on their extended hours to advertise that they’re open before and after work or school hours. This is great to display on the outside of your business because you want information that will stand out to potential patients and set you apart from the competition. It’s a hassle to take time off of work or take time off of work and take your child out of school so advertising the extended hours is sure to bring in new business. 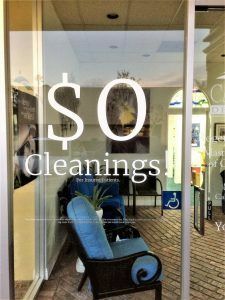 These window graphics were made just using white vinyl, but vinyl comes in many colors and can also be digitally printed on. Feel free to check out our website gallery to get ideas for your window graphics.